Bosco, aka Flowmeister, is a handsome red brindle almost 4-year-old male, born February 5, 2000. His sire is Molotov and his dam is Kelly Owen. He raced mostly up north, mainly in Iowa, and on December 4, 2003, cracked a bone in his foot at the Valley Race Park in Harlingen, ending his racing days. 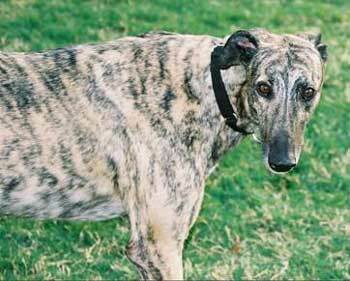 He was in a rehabilitation home in Austin, but is now healed and ready to find his forever home. 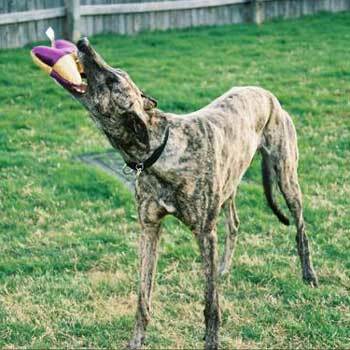 His foster mom says he is a gentle boy and he gets along well with other greyhounds and large dogs. Bosco comes in and out the dog door fine even though he is very tall. He has an alto voice; is very affectionate and doesn't want any trouble. If someone growls or raises their voice he wants no part of that. Bosco appears to be small animal and cat trainable. Bosco, aka Flowmeister, is a regal, gentle giant who enjoys life to its fullest. He loves his stuffy toys and usually keeps one with him most of the time. Bosco gets along well with our three greys and lab. Bosco has been an ideal citizen in the house. He's had no accidents inside and appears to be completely house broken. He goes into his crate with little or no assistance and once in his crate calmly lies down. Bosco can easily view the counter tops. He's curious but he has never been caught counter surfing. When he drinks from the water bowl it's like watching a kid bob for apples at the carnival. Bosco responds well to simple commands and genuinely wants to be a good boy. He's always by our side where ever we go. 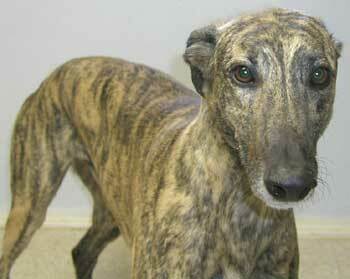 You can't help but love this greyhound, especially when he lays his head on your lap. Bosco is a joy to have in our home. He's good natured and has lots of character. Just look into those eyes and you can see for yourself. Anyone looking for a loyal and loving companion should meet Bosco. He's a big huggable teddy bear.